On Thursday, Trump tweeted that he would "terminate NAFTA" if he couldn't reach a fair deal. A day earlier, he agreed to renegotiate the free trade agreement between the US, Mexico and Canada. 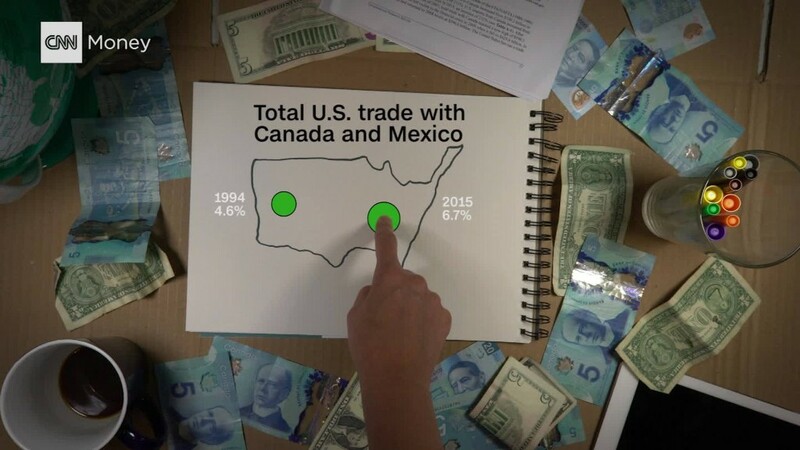 He has called NAFTA the worst trade deal in history and blames it for the loss of millions of US manufacturing jobs to Mexico, even though congressional nonpartisan research found that not to be true. Still, nobody really knows exactly what Trump wants a new deal to look like. Trade experts caution that if a new NAFTA deal creates American winners, it'll create American losers too. In a nutshell, manufacturing workers could benefit at the expense of US consumers and companies. 1. Require more car parts to be sourced from the US. Cars and auto parts are by far the biggest exports from Mexico to the US. A rule in NAFTA requires that any cars being sold in America -- or Canada or Mexico -- have 62.5% of auto parts from those three countries. It's called "rules of origin." "The rules of origin in NAFTA needs some tightening," Commerce Secretary Wilbur Ross told CNBC Thursday morning. What Ross probably means: Increase that percentage, forcing companies to source more of their parts and materials from Canada, Mexico and the US. Ross argued Thursday that Mexico hasn't enforced rules of origin, accusing it of sourcing some parts from China and claiming they were sourced from Mexico. Mexican officials say they comply by the rules. Experts say increasing rules of origin -- or more strictly enforcing it -- could help add manufacturing jobs in the US. But there's a catch. If you force car companies like Ford (F) and GM (GM) to use more US parts, that will likely raise car prices for ordinary Americans. Consumers would then have less cash to spend on other goods like clothing and sneakers. Some experts say that could cost jobs in other industries like retail. That's how it played out in the past. Higher car prices would also make US automakers less competitive globally. By forcing them to source more expensive US car parts, they would face the challenge of competing against foreign car companies that don't deal with the same restrictions. "It will result in some increase in US jobs at the expense of other sectors and of consumers," says Alan Deardorff, a trade expert at the University of Michigan. Trump's trade advisers say that any price increases would be modest and wouldn't have a major negative impact on ordinary Americans. Exactly how many jobs could come back is anyone's guess. And it's possible this rule change could backfire on Trump and cost more jobs than it brings back by raising consumer prices. Another way to encourage companies to bring back jobs is to level the playing field with Mexico. That means raising labor standards in Mexico by setting a limit on hours worked per week, ensuring employees are safe, paid a fair wage, and that the factories are meeting environmental standards. "Better labor standards would be good first and foremost for Mexicans. It's morally the right thing to do," says Scott Sinclair, a trade expert at the Canadian Centre for Policy Alternatives. The same goes for environmental laws. Some companies move jobs to Mexico because the air and water regulations aren't as strong, and companies can get away without paying a major penalty. Raising the bar on environmental laws in Mexico could convince companies to move jobs back. But experts say that it still doesn't guarantee more US jobs: If companies decide to build more factories in the US, many of the jobs will be done by hi-tech robots, rather than humans. In short: tougher regulations in Mexico would be good at an ethical level and could bring jobs back. But there's no guarantee the same number of jobs getting axed in Mexico would be the same number arriving in the US. Mexico charges a 16% value-added tax (VAT) to all companies operating in Mexico -- whether they are American or Mexican. Trump has called the tax unfair. Experts disagree and say Mexico's VAT is not much of a barrier. About 160 countries have a VAT. Canada has one, but Trump hasn't criticized it. The United States does not. For their part, Mexico and Canada want a deal that benefits them too. Experts say Trump should be prepared to offer concessions to them if he wants a new deal. Almost all options risk messing up North America's supply chains, which depend on free trade to function. Disrupting that web of businesses could have several ripple effects on the US economy.